The Prince Alfred's Guard Memorial stands in St Georges Park and was erected in 1907 in remembrance to men from the guard that died in four different wars. 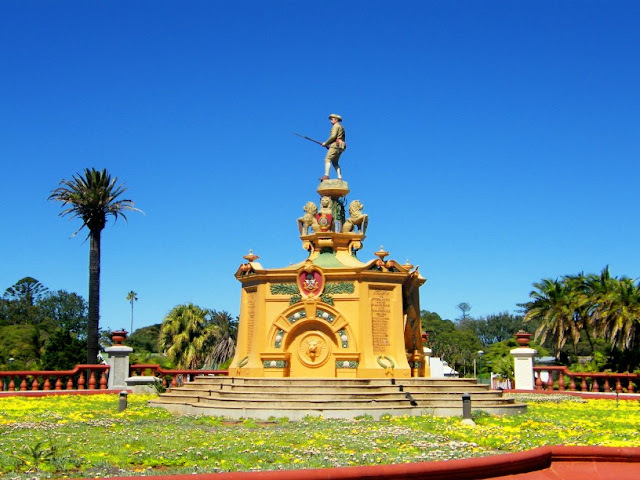 On each of the four corners of the base of the memorial is a tablet bearing the names of officers and men who fell in the Transkei War, 1877 ; Basutoland War, 1880-1881; Bechuanaland War, 1897; and the Anglo Boer War 1899 - 1902. At the foot of each tablet is a laurel wreath. On the top of the central pedestal is a life-size figure of a sergeant-major of Prince Alfred's Guard, in full dress and standing at the "charge" and immediately below him are four lions, each holding a shield. 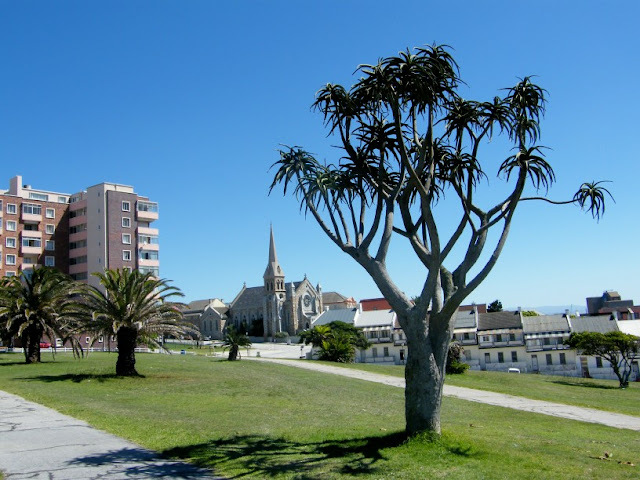 The Memorial is situated on top of Port Elizabeth's second oldest water reservoir. 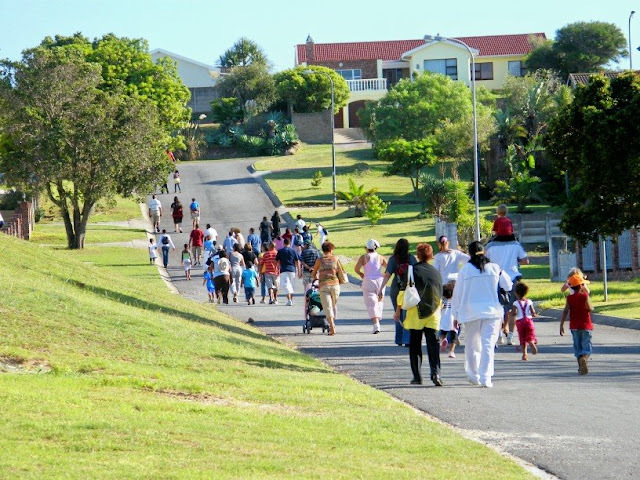 On Saturday morning we went to participate in a fun walk at the Westering Pre-primary school. It was a fund raising event for the school and was very well supported. Young and old, big and small, all had fun tackling the 4km route before heading back to the school for breakfast which was a choice between bacon and eggs or Halaal. 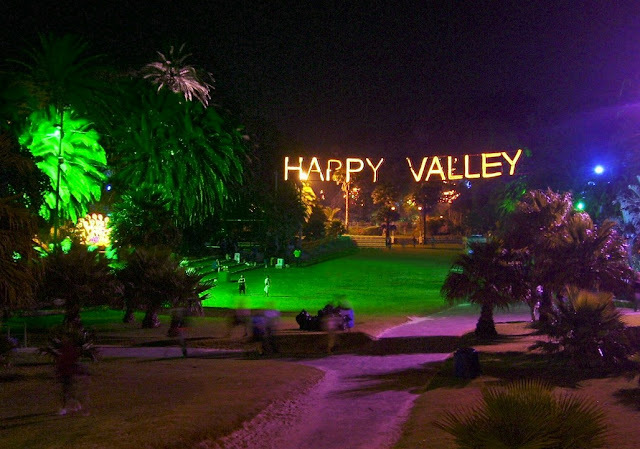 Who living in Port Elizabeth can say that they have never been to Happy Valley? Probably not many. Some people (like myself) went there as kids and now take their kids. I love going to Happy Valley. It is a wonderland of colourful lights and kids story and rhyme characters. 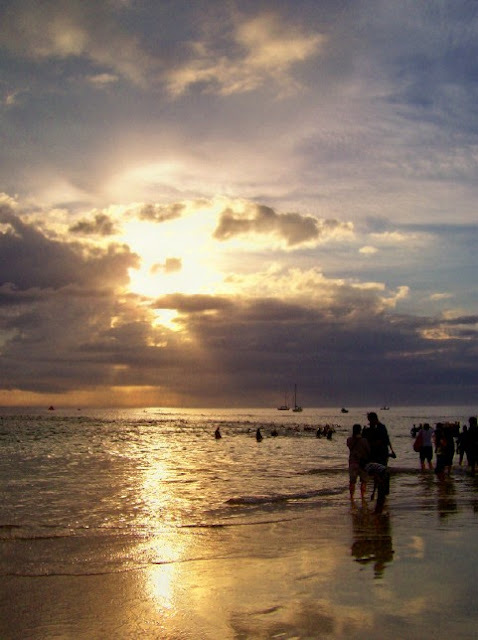 Happy Valley is situated on the beachfront just off Humewood Beach. It truly is a Port Elizabeth institution. For more on Happy Valley, go here. This picture was taken facing away from the Donkin Pyramid and lighthouse towards Donkin Street. The church in the background is The Hill Prespetarian Church with the Donkin Street Houses from the middle to the right of the picture. The tree in the foreground is a Tree Aloe (Aloe barberiae), which is normally found in thickets, kloofs and savanna in the east of South Africa. I popped down to St Georges Park during lunch time both yesterday and today to see a bit of the 4 day game between the Warriors, our local boys, and the Dolphins from Natal. 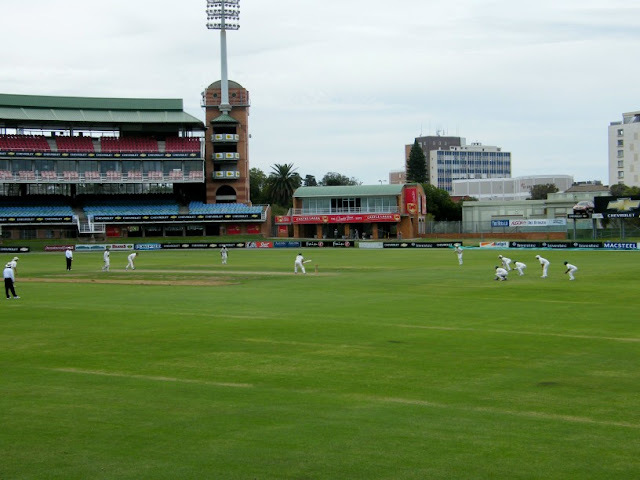 St Georges Park is the site of the oldest cricket club in South Africa, established in 1843. This is also the place where the first cricket test (1891) and the first rugby test (1891) in the country were played. The view accross Market Square in the city centre towards the Main Library. 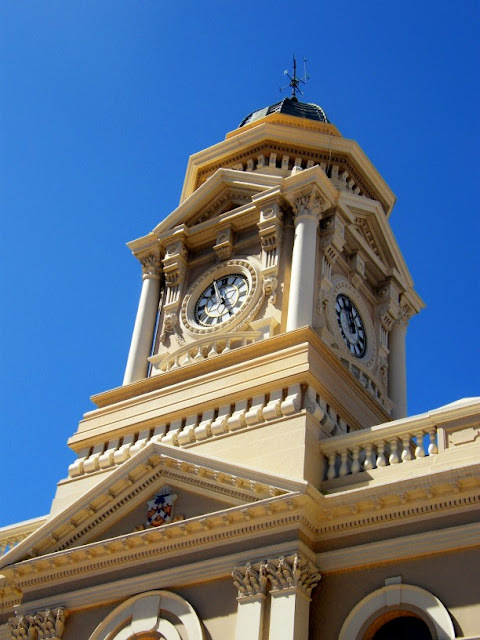 Port Elizabeth's beautiful colonial city hall was built between 1858 and 1862. The clock tower was added to the building in 1883. Unfortunately the building was just about destroyed by fire in 1977 and many paintings of early Port Elizabeth as well as the only original portrait of Lady Elizabeth Donkin was lost. The building was restored and re-opened in 1981. I popped down to the beachfront during lunch time today to get some fresh air. 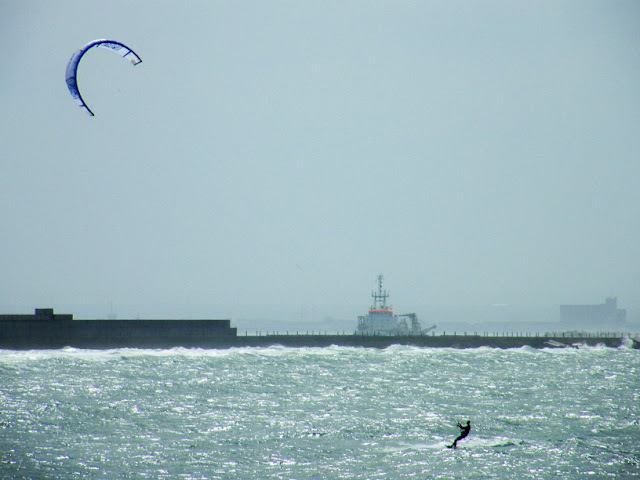 There was a strong south-easterly breeze blowing and looking back over Kings Beach towards the harbour I saw a lone kite surfer making the most of the ideal conditions. My office is very close to the South End cemetery and when I have nothing to do I normally take a slow drive through the cemetery looking for interesting monuments and angles to photograph. The other day I realised that while I was looking for the little things, the big picture was passing me by. 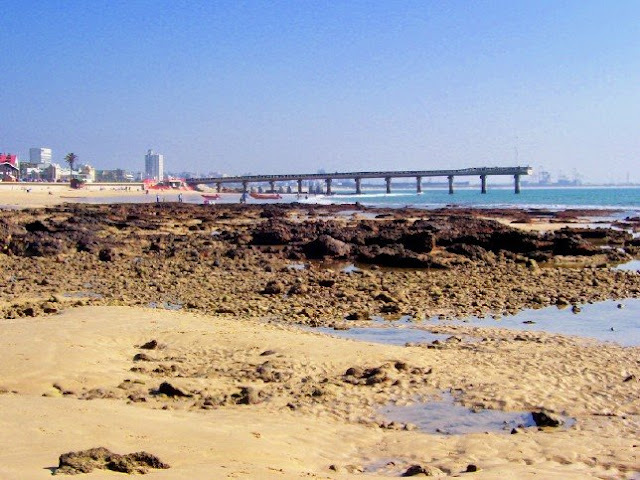 At low tide the rocky shore line next to the main swimming beach at Hobie Beach (with Shark Rock Pier) gets exposed. In the summer you often find people with young children wading through the ponds in search of something interesting. The one day we found an octopus under one of the rocks which really intrigued Chaos Boy. There are normally also a couple of bird species hanging around, but for me the most interesting by far is the endangered Black Oyster Catcher. The Horse Memorial is on of only a few monuments in the world specially dedicated to horses. 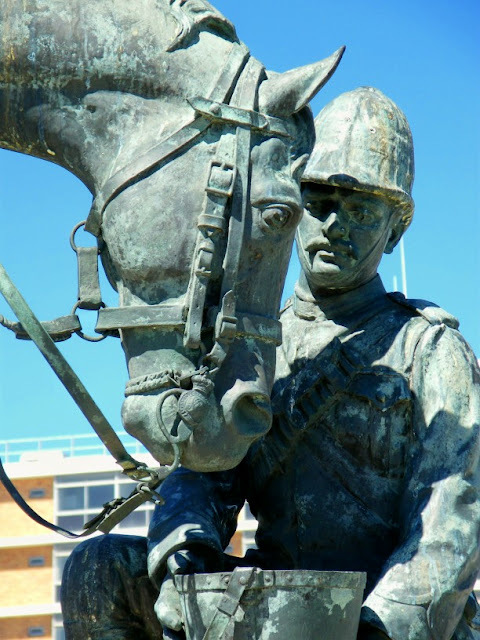 Unveiled in 1905, the monument commemorates the horses that suffered and died during the Anglo-boer War (1899-1902). It consists of life-sized bronze figures of a horse about to quench its thirst from a bucket held by a kneeling soldier and stands on the corner of Russell Road and Rink Street. 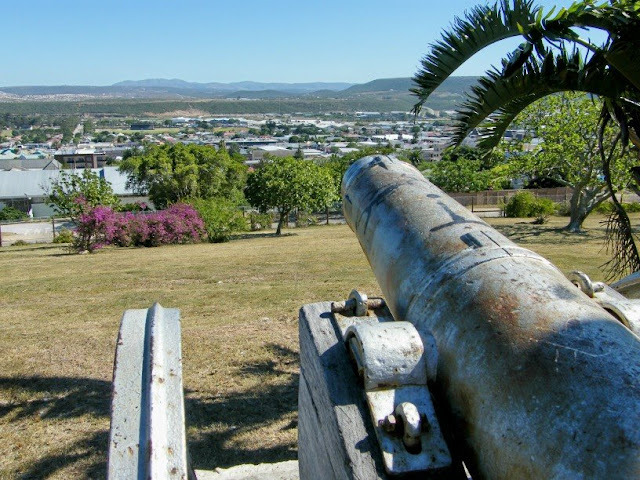 The view from Canon Hill overlooking the town of Uitenhage. 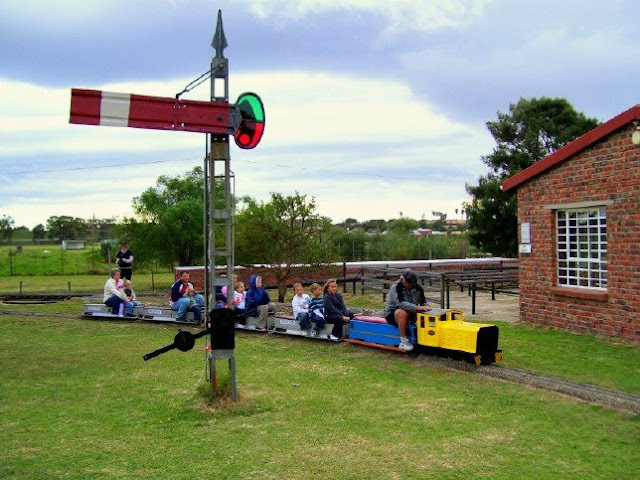 Uitenhage is about 35 km from Port Elizabeth and along with Port Elizabeth, Despatch, Colchester and the surrounding areas it forms Nelson Mandela Bay. In the townships you get to see many unusual sites. Well, unusual for those of us not used to daily township life. One of those is seeing somebody prepare smileys. A smiley is the head of a sheep. It gets put into the fire to burn off all the hair and skin and then cooked. 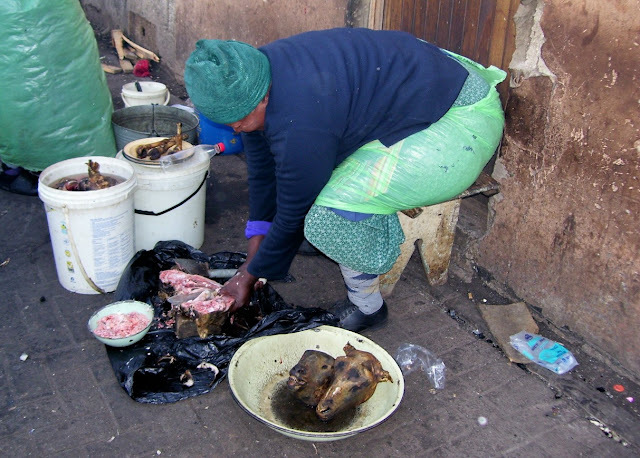 It is a traditional delicacy in the townships and a very popular dish. This lady was preparing smileys in Njoli Square. The Public Library building next to Market Square was opened in 1902. The terracotta facade was manufactured in England and shipped to Algoa Bay in numbered pieces to be reassembled on site. 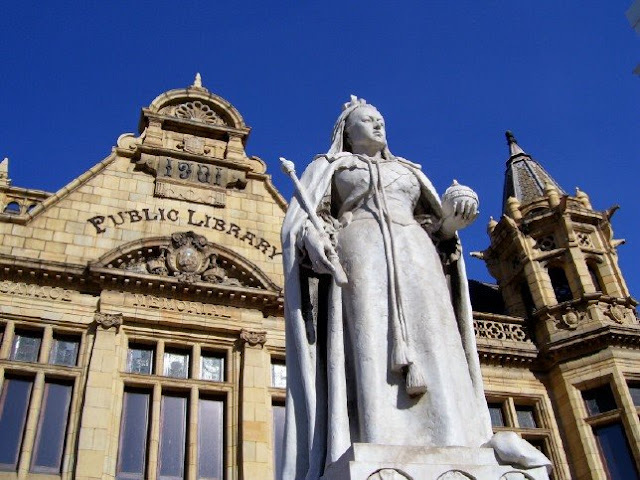 The statue of Queen Victoria was unveiled in 1903 and is made of Sicilian marble. 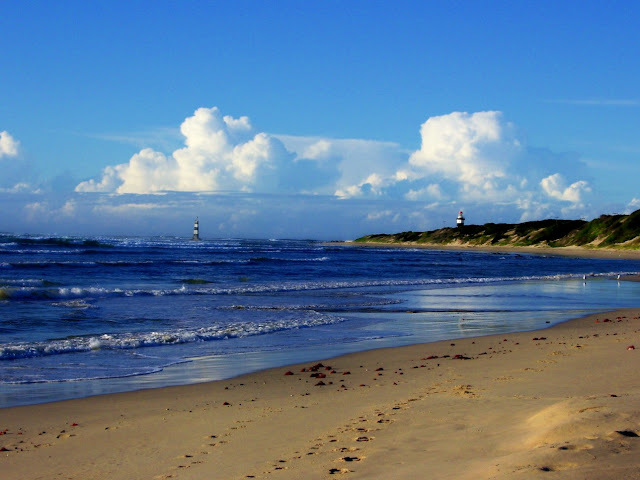 This pic was taken on the beach at Cape Recife on the Algoa Bay side looking south at the Cape Recife lighthouse (right) and one of the shipping beacons (left). I specially liked the cloud formation in the background. WOW! So here I am. Taking over the Port Elizabeth Daily Photo from my blog idols. At the start of December 2007 I didn't even know what a blog was and stumbled onto the PEDP blog after following a link from a Google Alert. I popped in every now and then and soon became a regular follower. Being a keen photographer, I started to wonder if I could do my own photo blog and on 9 July 2008 I took the big step into the blogosphere, starting The Firefly Photo Files. All because of Sue and Max. They were my inspiration and if it wasn't for them I would never have gotten into blogging. Big was my surprise this week when I received an e-mail from Sue asking me if I would be interested in taking over PEDP. I was speechless... but very honoured that they considered me to take over their baby. And it is a challenge I am savouring. I will still be doing The Firefly Photo Files. 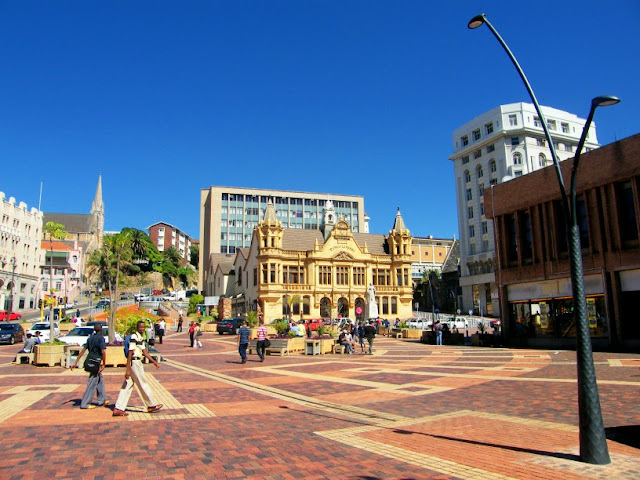 Although Port Elizabeth features prominently there, I cover everything from the world I live and travel in as well as nature, animals, birds, plants and so much more. The two blogs will actually compliment each other very nicely. This is not the start of a new journey, but the continuation of an old one. So I hope all the loyal PEDP followers will keep on coming back for their daily Port Elizabeth fix. I was wondering what to do as my first picture, so for my first Port Elizabeth Daily Photo post I decided on the same photo I started with on The Firefly Photo Files. Sunrise over Hobie Beach. Enjoy the ride! Well this is it... time to say goodbye, (see yesterday's post if this takes you by surprise!) and thank you all for you loyal visits and the friendships we have made. Firefly, thanks again for adopting our baby! May it give you lots of joy, and not too many nappies to change! We also want to thank the helpful community at City Daily Photo Blog who do a huge amount of work, and a great job administering the group. We thought we'd go out with a selection of some favourite photos that have featured here, in no particular order... ones that really capture why PE is such a special place to live, and why it has been a joy sharing it with the world. And we'll go out with a BANG! Cheers! Post no 499... big changes coming! Apple Express Trains being refurbished at the diesel depot in Humewood, reflecting in the engineers pit. OK, we have a sort of "good news ,bad news" scenario for you. The bad news is that after almost 500 posts on this blog, we are ready to take a break. We have made some wonderful friends around the world, and it has been fun. We will miss you, and I know many of you enjoy your visits to see what is going on in PE. So that is where the good news comes in... we don't want to abandon you guys who love checking up on the old home town from time to time. And we are leaving you in some extremely capable hands... Firefly is an ex tour guide and works in the tourism industry. He is passionate about PE, and very well informed too, as well as a great photographer. He has agreed to adopt our baby and keep it going. So tommorrow we will go out with a bang, and our 500th post will be some of our all time favourite photos... and then on Sunday, please welcome Firefly into the driving seat, we are sure you will enjoy the ride! while Max does a quick battery change on board the visiting Portuguese ship Sagres, with a fascinated grandson looking on. This isn't the greatest photo, again the light was green in our favour and there was no time to compose or zoom. It was taken recently from the intersection of Russell Road and Rink Street just before 5am on a Saturday. The Parliament Street all night party begins to ease up, and the last revellers converge on the apron of the Service Station across the road, dancing to music that blares from various cars. All this would be quite festive if it wasn't for two unfortunate habits... urinating in the street and breaking the liquor and beer bottles as they are emptied. Since we have been doing neighbourhood watch patrols, I have had to repair my tyres 4 times, because it is sometimes impossible to see the glass on the streets at night, until it is too late. We have seen cleaners trying to keep the street clean throughout the night, presumably employed by the committee that looks after the Parliament Street upgrade. I wonder if this doesn't just make the party-goers even less responsible for their actions... they rightly surmise that their bad habits are creating employment for others, so they carry on regardless. Rather than feeling bad about anti-social behaviour that costs the City a fortune, they feel good that they are benefitting the cleaners! Please excuse the hiatus, we have been in East London for a few days visiting family, and both forgot our cables to go online with our cellphones. 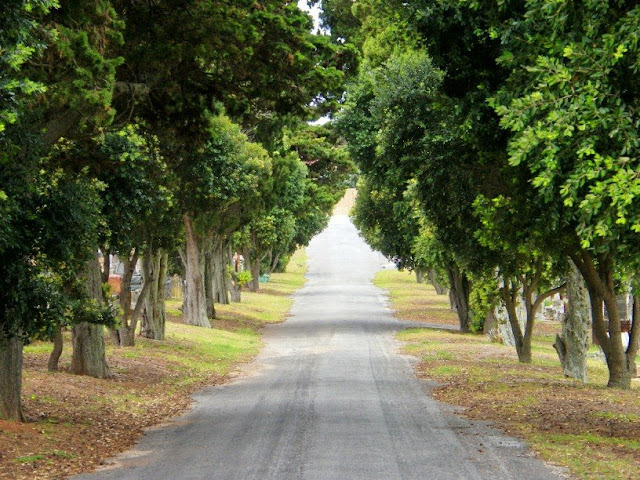 About 50 km out of PE, on the freeway running eastwards along the coast, you reach a famous intersection, and here you decide whether to take the road North through Cradock, NE through Grahamstown, Or East along the coastal road to Port Alfred and East London. A popular landmark for the last 30 years has been the small farmstall which specialises in wonderful home made jams, baked goods and traditional South African cuisine. The stall suffered a fire and has been ressurected nearby in a stunning large building around a courtyard. Well worth a visit! There has been a lot of conflict lately between the Taxi drivers and the Municipality, over the building of a Rapid Bus system. This has left construction at a standstill, and Govan Mbeki Ave from the bottom of Evatt Street to the corner of Albany Rd is reduced to 1 narrow lane either way, and no parking available, even outside the main Post Office. Hopefully the current agreement will be honoured, and the town can return to normal soon! 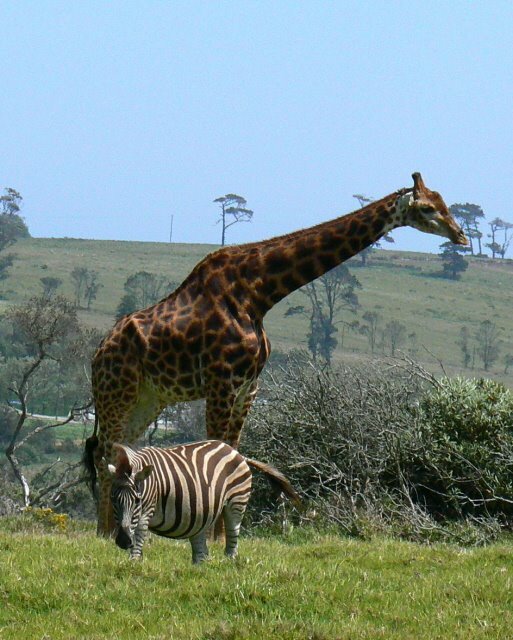 Kragga Kamma Game Reserve on the outskirts of town, we are truly lucky to have a place like this, where we can enjoy our wildlife so close at hand. Pule asked us to show Govan Mbeki looking the other way from the City Hall towards North End. Why are robots only green when you WANT a red light? I was late for a meeting and did not have time to find parking and walk back. So this is the best we could do as we had to go with the traffic flow. This is the section of Govan Mbeki Ave between Russell Rd and The bottom of Donkin Hill. 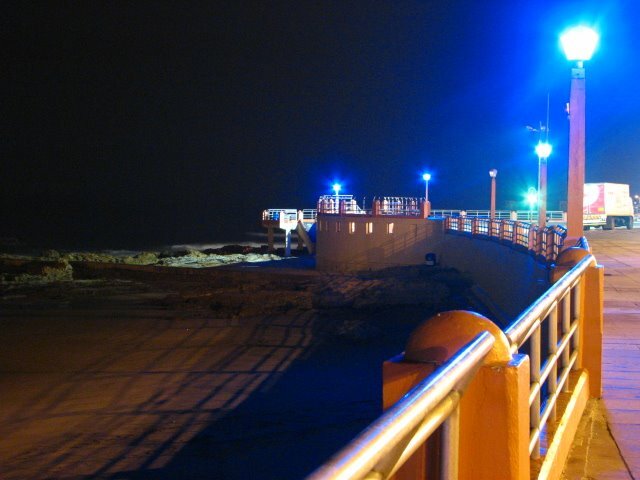 It is currently under construction, to upgrade it along similar lines to the section near the City Hall. At the moment, perhaps the best thing that can be said is "watch this space!"